Friedens Peace is delighted to welcome Emmaus into their building to hold worship and Bible study. Beginning in April, Emmaus will move their Sunday worship service at 1 pm as well as a weekly Wednesday Bible Study and potluck to the Friedens Peace location. Rev. Andrea Asselmeier, Emmaus chaplain, and Rev. Cindy Bumb, Vice President of Spiritual Care, serve the spiritual needs of the 270+ Emmaus clients who reside in in St. Charles, Warren, Franklin, Lincoln, and St. Louis counties. Many of these clients have found church homes in their various communities. 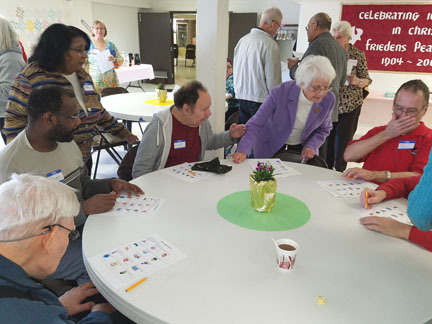 However, the weekly worship and Bible study provide an opportunity to connect with other Emmaus clients. An Ice-breaker activity helped everyone get acquainted. Pastor Andrea Asselmeier, Emmaus Chaplain. 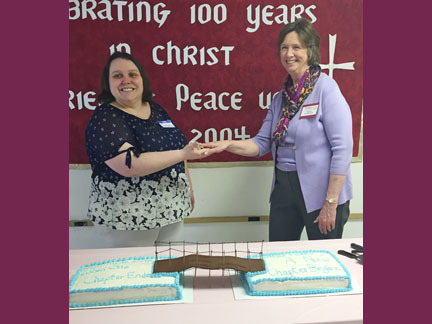 The cake depicted crossing a bridge from the Emmaus Chapel to Friedens Peace UCC.